Carlos Fuentes. Fuentes, Carlos, photograph. AP images. Carlos Fuentes is widely regarded as Mexico’s foremost contemporary novelist. His overriding literary concern is to establish a viable Mexican identity, both as an autonomous entity and in relation to the outside world. In his work, Fuentes often intertwines myth, legend, and history to examine his country’s roots and discover the essence of modern Mexican society. Fuentes writes: ‘‘Our political life is fragmented, our history shot through with failure, but our cultural tradition is rich, and I think the time is coming when we will have to look at our faces, our own past.’’ This tradition incorporates elements of Aztec culture, the Christian faith imparted by the Spanish conquistadors, and the failed hopes of the Mexican Revolution. Fuentes uses the past, thematically and symbolically, to comment on contemporary concerns and to project his own vision of Mexico’s future. Diplomatic Roots, Law School, and International Service. 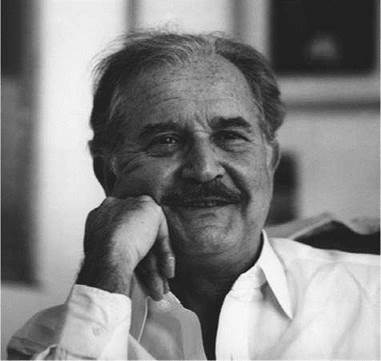 Carlos Fuentes, the son of a Mexican career diplomat, was born on November 11, 1928, in Panama City, Panama. As a child, he lived at several diplomatic posts in Latin America and spent much of the 1930s in Washington, D.C. He attended high school in Mexico City and later entered the National University of Mexico. While studying law there, he published several short stories and critical essays in journals. After graduating from law school, Fuentes traveled to Geneva, Switzerland, to study international law and in 1950 began a long career in foreign affairs that culminated in his serving as Mexico’s ambassador to France from 1975 to 1977. The Latin American Literature “Boom”. Fuentes wrote throughout his diplomatic career, and in the late 1950s and early 1960s he gained international attention as an important contributor to the ‘‘boom’’ in Latin American literature. Along with such authors as Gabriel Garcia Marquez and Julio Cortazar, Fuentes published works that received international acclaim and spurred the reassessment of the position that Latin American authors held in contemporary literature. Fuentes’s work, like that of several writers associated with the ‘‘boom,’’ is technically experimental, featuring disjointed chronology, varying narrative perspectives, and rapid cuts between scenes, through which he creates a surreal atmosphere. For example, in his first novel, Where the Air Is Clear (1958), Fuentes uses a series of montage-like sequences to investigate the vast range of personal histories and lifestyles in Mexico City. This work, which provoked controversy due to its candid portrayal of social inequity and its socialist overtones, expresses Fuentes’s perception of how the Mexican Revolution of the early twentieth century failed to realize its ideals. This revolution, which begun with an uprising led by Fransisco I, was a reaction against the politics of dictator Porfirio Diaz and, ultimately, led to a complicated civil war. The frustration of the revolution, a recurring theme in his writing, forms the basis for one of Fuentes’s most respected novels, The Death of Artemio Cruz (1962). Use of the Fantastic. In the novella Aura (1962), Fuentes displays less concern with social criticism and makes greater use of bizarre images and the fantastic. Fuentes employs a disordered narrative in A Change of Skin (1967) to present a group of people who relive significant moments from their past as they travel together through Mexico. Fuentes’s concern with the role of the past in determining the present is further demonstrated in Terra Nostra (1975), one of his most ambitious and successful works. Negotiating the Contextual Mexican Identity with Magic Realism. Fuentes’s later fiction investigates Mexico’s relationship with the rest of the world. Distant Relations (1980), for example, involves a Mexican archaeologist and his son who meet relatives in France; on another level, however, this work is about the interaction between Mexican and European cultures. In this novel, an old man relates a tale to a man named Carlos Fuentes, who in turn relates the tale to the reader. Through the inclusion of ghosts and mysterious characters, Fuentes also introduces fantastic events into otherwise realistic settings, a technique prevalent in Latin American literature that is often termed magic realism. In the novel The Old Gringo (1985), which examines Mexican-American relations, Fuentes creates an imaginative scenario of the fate that befell American journalist Ambrose Bierce after he disappeared in Mexico in 1913. Plays, Short Stories, and Critical Essays. In addition to his novels, Fuentes has written several plays, including Orchids in the Moonlight (1982), and has published the short-story collections Los dias enmascarados (1954), Cantar de ciegos (1964), and Chac Mool y otros cuentos (1973). Many of his short stories appear in English translation in Burnt Water (1980). Fuentes is also respected for his essays, the topics of which range from social and political criticism to discussions of Mexican art. In 1989 The Old Gringo was adapted as a film starring Jane Fonda and Gregory Peck. In 1994, said to be based on an alleged affair he had with the American actress Jean Seberg, Fuentes published Diana, the Goddess Who Hunts Alone, sparking controversy about the historical accuracy of the book’s contents. Throughout the 1990s and up to present day, Fuentes has steadily published novels, short stories, critical essays on politics and culture, in addition to his academic duties as professor at Brown University; he has taught courses at universities throughout the United States. Julio Cortazar (1914-1984): Born in Belgium, Julio Cortazar was an Argentine writer who spent the last thirty years of his life in exile after he vocally opposed the dictatorship of Argentina's Juan Perron. Edward Albee (1928-): American playwright famous for integrating absurdist elements into American theater. A three-time Pulitzer Prize winner, Albee is most widely known for having written the play Who's Afraid of Virginia Woolf? (1962). Alejo Carpentier (1904-1980): Cuban novelist who exerted a tremendous influence on contemporary Latin American writers; his writings are considered some of the earliest examples of magic realism. Gregory Peck (1916-2003): American actor Peck was a major box office draw from the 1940s to the 1960s. One of Peck's last roles was in the film version of Old Gringo (1989). Jean Seberg (1938-1979): An American actress best remembered for her roles in the "NewWave" of French cinema in the 1960s. Fuentes's fictionalized relationship with Seberg was the subject of his work Diana, the Goddess Who Hunts Alone (1994). Among Fuentes’s major themes are the quest for Mexican national identity—influenced by the writings of the Mexican philosophers Jose Vasconcelos and Samuel Ramos, and by the seminal work on the Mexican national character by Octavio Paz, The Labyrinth of Solitude (1950)—and a continued and profound exploration of the components of that identity: political, historic, social, psychological, and mythic. One of Fuentes’s most compelling themes is the world of the gods and goddesses of the Aztec pantheon—especially the god of life and love, Quetzalcoatl—his downfall and self-banishment from the New World, and his supposed return in the form of the Spanish conquistador Hernan Cortes, examined in Terra Nostra and in his drama Todos losgatos son pardos. American Influence on Mexico. Another theme that appears throughout Fuentes’s work is that of the United States and the tremendous social, cultural, and political impact it has exerted on his homeland, Mexico. Fuentes is decidedly ambivalent toward the country viewed in Latin America as the Colossus of the North. He spent much of his life traveling and lecturing in the United States, teaching at major North American universities, and collaborating on Public Broadcasting Service (PBS) projects, such as the one commemorating the voyage of Christopher Columbus in 1492. In his fictional works Fuentes emphasizes the fact that the greatest revolutionary force in Mexico is not the rebellious, ultimately defeated, los de abajo (lower class) but the North American presence. And in Old Gringo, in an attempt to come to grips with the North American-Mexican cultural clash, Fuentes evokes a revolutionary Mexico at the beginning of the twentieth century through North American eyes and from a feminist perspective. Thus the narrator and the most important character is neither the acerbic and misanthropic Ambrose Bierce, to whom the title refers, nor the revolutionary general in the army of Pancho Villa, Tomas Arroyo—who in a fit of rage kills Bierce, ironically granting Bierce the death he has sought in Mexico—but the recluse, Harriet Winslow. The History and Future of Mexico. Fuentes’s concern with the role of the past in determining the present is further demonstrated in Terra Nostra. Many critics believe that this novel exceeds the scope of his earlier fiction, extending the idea of history as a circular force by incorporating scenes from the future into the text. Terra Nostra is divided into three sections: ‘‘The Old World,’’ which concerns Spain during the reign of Philip II; ‘‘The New World,’’ about the Spanish conquest of Mexico; and ‘‘The Next World,’’ which ends as the twenty-first century begins. By tracing the evolution of Mexico beginning with the Spanish conquest, Fuentes depicts the violence and cruelty that originated in the Mediterranean area and was perpetuated in Mexico through Spanish colonialism. Christopher Unborn (1987), a verbally extravagant novel, continues Fuentes’s interest in Mexican history. This work is narrated by Christopher Palomar, an omniscient fetus conceived by his parents in hopes of winning a contest to commemorate the quincentenary of Christopher Columbus’s arrival in the Americas. According to contest rules, the male baby born closest to midnight on October 12, 1992, whose family name most closely resembles Columbus will assume leadership of Mexico at the age of twenty-one. The novel’s nine chapters symbolize Christopher’s gestation and allude to Columbus’s voyage, which Fuentes views as a symbol of hope for Mexico’s rediscovery and rebirth. Narrating from his mother’s womb, Christopher uses wordplay, literary allusions, and grotesque humor, combining family history with caustic observations on the economic and environmental crises afflicting contemporary Mexico. Christopher Unborn satirizes Mexico’s government as inept and its citizenry as complacent, warning that the country’s collapse is imminent without change. As a key figure in the Latin American ‘‘boom’’ of the mid-twentieth century, Fuentes has exerted a considerable influence on later generations of Latin American writers. Vaulted to international fame and respect, Fuentes and his fellow boom writers loom so large that later writers who followed in their footsteps are called ‘‘post-boom.’’ Writers like Isabel Allende, whom Frederick Nunn has called ‘‘a product of the Boom,’’ are indirectly influenced by Fuentes and his ilk; as a reaction against the thematic and stylistic experiments of the boom, they have returned to a more realistic, naturalistic writing style. Style differences aside, their success and international acclaim are a direct result of the trails blazed by the likes of Fuentes. The Plumed Serpent (1926), a novel by D. H. Lawrence. The title references the serpent-god Quetzalcoatl. This work, written from the perspective of non-Mexican outsiders, explores both contemporary Mexico and its pre-Columbian past. Fuentes’s achievements in the novel genre have been recognized through his being awarded several distinguished prizes including the Premio Alfonso Reyes in 1980. Cambio de piel, one of his most intricate and problematic novels, was awarded the Premio Biblioteca Breve by the Barcelona publishing house Seix Barral. In 1975 Fuentes received the Premio Xavier Villaurrutia in Mexico City and in 1977 was awarded the Romulo Gallegos prize in Venezuela, both honors for his novel Terra Nostra, which he wrote while a fellow at the Woodrow Wilson International Center for Scholars in Washington, D.C. In 1984 he was awarded the Mexican Premio Nacional de la Literatura by President Miguel de la Madrid, and in 1987 he received the Spanish Premio Cervantes in Madrid, awarded by King Juan Carlos. 1. Read Ambrose Bierce’s famous short story ‘‘An Occurrence at Owl Creek Bridge,’’ which is mentioned in Old Gringo. What does that story tell you about the character of Bierce as Carlos Fuentes portrays him in the novel? 2. Fuentes outlines a projection of the future of the Hispanic people in Terra Nostra. Read and analyze this projection. Do you agree with Fuentes’s ideas? Why or why not? 3. The stories of Carlos Fuentes can range over a wide variety of themes. Contrast two stories that deal with dissimilar themes and analyze their differences. 4. Identify and characterize conflicting layers of society in Fuentes’s short stories. How do the different elements interact with each other? Brushwood, John S. Mexico in Its Novel: A Nation’s Search for Identity. Austin: University of Texas Press, 1966. ‘‘The Old Gringo.’’ Novels for Students. Eds. Marie Rose Napierkowski and Deborah A. Stanley. Vol. 8. Detroit: Gale, 2000.